The iPad might not be the final destination for your images, but with Apple's Camera Connection Kit, it can be a great stop along the way. You can preview your photos on its large screen, build dynamic presentations with them in Keynote while you sip coffee at a cafe, or publish your favorite pictures online—all without cracking open a laptop. Here are some ways enthusiast photographers can build a decent workflow right now using the iPad with the optional Camera Connection Kit. For photographers, the more internal memory your iPad has, the better. We'll be moving large files on and off of the device, so having a little extra memory gives you more flexibility. Along with the optional Camera Connection Kit, you might want a USB memory card reader for cameras that don't use SD cards, or at least the USB cable that connects your camera directly to the iPad adapter. A big challenge for travel photographers is backing up their photos while in the field. You are the most vulnerable to losing a picture right after you take it. At that moment the shot lives only in one place: on your camera's memory card. For many photographers, the iPad can serve as a beautiful backup device. When you take a break from shooting, transfer the images from your memory card to the iPad. Now your photos live in two places. Don't make the mistake of erasing the images off your memory card after transfer! This puts you back in the "only lives in one spot" vulnerable position. Memory cards are cheap. Plan on bringing enough of them so you don't have to erase images until everything is home, backed up onto a hard drive, and safe and sound. Amazingly enough, the iPad supports the same raw files that your Mac does. You can upload these files from your camera to the iPad and they will appear as regular photos in the Photos app, Keynote, and third-party applications. When you transfer the images off of the iPad to your Mac, they will maintain their full raw integrity. 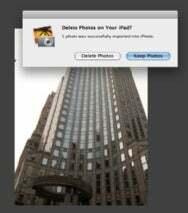 If you email them from the iPad, however, they will be attached as a converted full-sized JPEG instead of a raw file. Because raw files take up more space than JPEGs, you will want to move them off your iPad as soon as possible. But what about those great raw shots that you want to keep on the iPad for sharing with others? There's a terrific solution called Raw+JPEG. Most cameras that support raw files also have a setting called "Raw+JPEG" that allows you to capture a JPEG at the same time. The iPad recognizes both versions of the image and imports them as a pair. When you upload them using the Camera Connector Kit, you'll see the badge "RAW+JPG" on the thumbnails in the Photos app's Import tab. The problem at first is that this couple seems inseparable. The trick is to move the raw files off of your iPad to free up space, while leaving the JPEGs behind to play with. You already have two applications on your Mac that will let you do this: iPhoto and Image Capture. When you plug the iPad into the Mac and launch iPhoto, the JPEGs and the raws will show up as separate files. Simply select all of the raw images for import by Command-clicking them. When the "Delete Photos on Your iPad?" message appears, click "Delete Photos." iPhoto will remove the raw files from your iPad and leave the JPEGSs behind for you to view, edit, or send along to others. If you're not an iPhoto user, you can opt to let Image Capture handle the heavy lifting. Before importing files, be sure to check the box in the lower left corner by "Delete After Import." Then choose the raw files in Image Capture's import browser, select the destination (such as a connected external hard drive where all your other raw files are stored), and click Import. Just like with iPhoto, Image Capture will put the raw files where you want, remove them from the iPad, and leave only the JPEGs in the iPad library. When I shoot with my Canon 5D Mark II, I can even set the size of the accompanying JPEG in-camera when I shoot Raw+JPEG. I choose the Small size, which is 2784-by-1856—still tons of extra resolution for viewing and cropping on the iPad, but not consuming any more memory than necessary. By comparison, if I chose the Large version of the JPEG, that resolution is 5616-by-3744—a bit more than I need for iPad use. After you upload images via the Camera Connection Kit, you'll see two new Albums on the iPad: Last Import and All Imported. This is where your images go and the bad news is that you really don't have any options for moving them around in the Photos app to new albums. The good news is that those two albums show up in the import photos pop-up menu for Keynote, Pages, and every other iPad app that lets you bring in photos. That means if I want to build a slideshow based on a handful of those JPEGs that I've imported to the iPad, I just open Keynote, choose a theme, add the photos I want from the import albums, and I'm done. Plus, I can export this presentation back to my Mac. If something goes wrong, you will still have all of your original images on the camera memory cards that you've tucked away. In addition to the copies in your iPad, make sure that you have a complete backup of them at home before erasing and reusing the cards. Connect your memory card or camera to the iPad via the Camera Connection Kit. Tap the Import All button on the iPad if you want all of the images. If you only want to bring selected shots in to the iPad, tap the images you want, then tap Import. Via a popup menu, you'll be presented with the options "Import All" or "Import Selected." Choose "Import Selected." The blue check marks from your selected images will turn green as they are transferred to the iPad. On the iPad, tap the Albums button. You'll see that you have two new albums: "Last Imported" and "All Imported." Play with and enjoy your photos on the iPad. When you get home, connect the iPad to your Mac and launch iPhoto. It will display the raw files and JPEGs separately (if you shot Raw+JPEG). Select the raw files only, select Import, then choose Delete Photos once the import is complete. If you shot JPEGs only, you may want to click on Keep Photos, letting you thin the shots you want to keep on the iPad itself at a later date. All the images in the "All Imported" album on the iPad will be available for use via any application that can access images in the Photos app.